We have compiled a list of Frequently Asked Questions to assist you as you begin planning for this substantive, active week! Cool clothes and a sweater or jacket. The temperatures vary...so better to be prepared. • A bag that fits over your shoulder to carry your “stuff,” including a hefty notebook and other goodies that will be provided for you. whatever you bring. Sketches, etc. will be optional. Yes! But, be sure to be on time every morning, after breaks, and after lunch! Assorted breakfast faire, drinks and snacks are provided daily. You will be on your own for lunch so feel free to bring your lunch or dine at one of the local restaurants listed below. Please let us know if you have any special diet needs that we need to be aware of as we order food for our opening night dinner and bag lunches on our trip to Brooklyn. 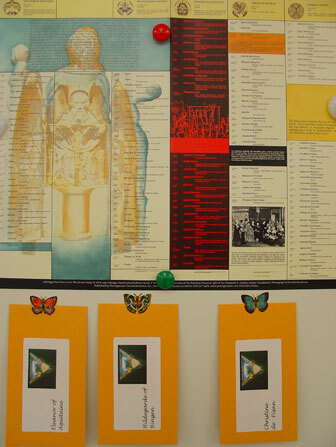 There are a handful of tasks we are asking you to complete prior to the beginning of the institute. 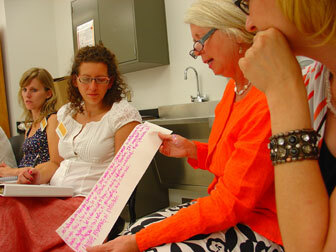 Click here for more information on these Pre-Institute Activities. ACT 48 hours available for credit and noncredit options. What if I am flying in? Many of you already have made flight plans. The best airport to fly into is Allentown since it is closer to Kutztown and less hassle than Philadelphia. We will provide transportation to and from the airport. NOTE that housing is scheduled from Sunday through Thursday nights. If you need to stay over an additional night or need to come in early, please let us know as soon as possible. We can make arrangements for this on a case-by-case basis. What if I am planning to stay on campus? Some of you have requested and paid for housing during your stay at Kutztown. You will be staying in the Golden Bear Village SOUTH. These apartments contain two double-occupancy and two single-occupancy bedrooms. Each apartment has two bathrooms, a kitchenette and a furnished living room. You will have very limited kitchen facilities with a refrigerator and cook-top. Dishes and cookware are NOT provided. We DO provide towels, pillow and sheets for you. You may wish to bring a blanket. NOTE: When you arrive on campus, call 484-797-3097 and a staff member will meet you at Golden Bear VIlliage South to check you in and give you your keys. You may park anywhere on campus between white lines—NOT yellow. See the #44 on this map for the location of the Golden Bear Villiage South Apartments and #13 for Sharadin Arts Building, and parking. 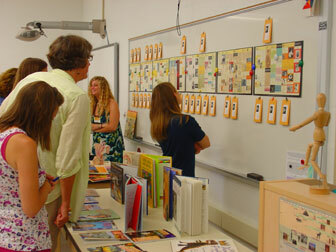 Participants take time to browse through selected books and a reproduction of the Heritage Panels. 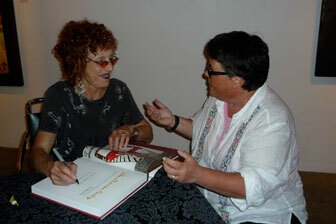 Judy Chicago takes a moment to sign her book and talk with Barbara, graduate student at Kutztown University. During a circle discussion on Feminisim, participants shared the key points that resonated with them from selected readings. 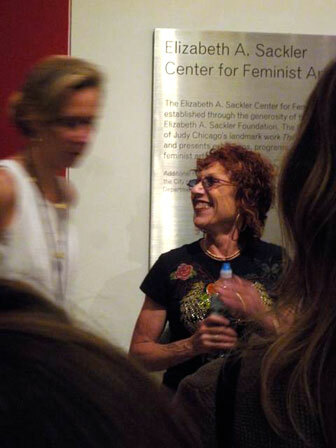 Judy Chicago smiles as Catherine J. Morris introduces the participants to the Elizabeth A. Sackler Center for Feminist Art.